A belated “Happy Independence Day” to all of our partners. I hope everyone enjoyed summer sunshine, great food, fireworks and well-deserved rest and relaxation with family and friends. 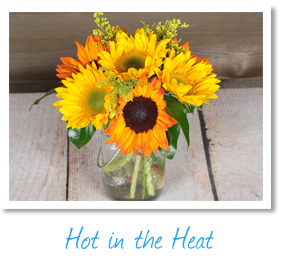 Leading up to the 4th of July, Dos Gringos made the most of a unique opportunity to boost awareness of the floral industry and help showcase the incredible impact fresh flowers, especially Sunflowers, can make on people. 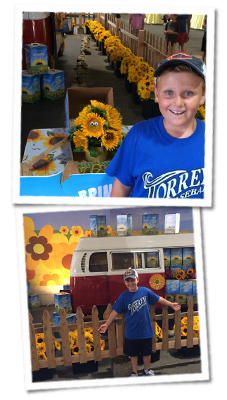 We were proud to feature our Sunflowers for the first time ever in a display booth inside the Flower Pavilion at the five-week San Diego County Fair. 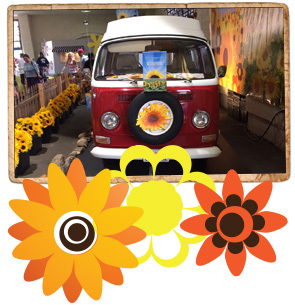 Against the backdrop of a 1960’s Beatles theme – Fab Fair – we surrounded a bright, red, mint condition Volkswagen bus, with 1,000 stems of beautiful Sunflowers, which we refreshed each week. It packed a punch for the 1,457,130 visits the Fair recorded for this year. 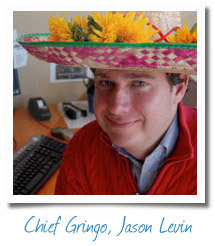 Anyone who is familiar with Dos Gringos knows our vision: flowers on every tabletop, smiles on millions of faces. I’m pleased to introduce a recent initiative that brings us closer to achieving this goal. This week, after months of ideation and product development, we launched an expanded Collection that gives customers an easy, affordable way to enjoy Sunflowers and fresh greens seasons after season, 365 a year. Originally designed and developed as a promotion for holidays and special occasions, our Mason Jar Collection provides “affordable luxury” year-round. Simple, fuss-free arrangements with fun names like;Wagon Wheel, Color Pop, and Autumn Afternoon are big on pretty and easy on price. Our available access to incorporating interesting California greens and fillers into our arrangements will guarantee combinations you won’t see elsewhere. With a lot of help from Rachel Larsen, a Marketing major at San Diego State and a DG summer intern, our Marketing Team is rolling out a new catalog, flyers, sell sheets, email blasts and “How-To” videos to support this expanded line. Our Business Development Team will also be making the Mason Jar collection part of upcoming client conversations. 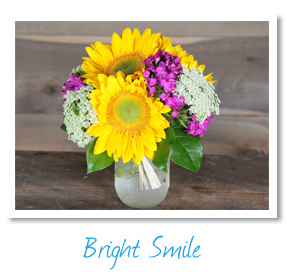 As we continue to be your experts on Sunflower knowledge and product, we would love to hear your feedback. Please take some time and tell us what you think of our new collection and how it works for you! Together we can take the DG Mason Jar Collection to the next level and continue to drive flower sales higher.